If I'm not sewing or on the computer, you'll find me in the garden with Lala. 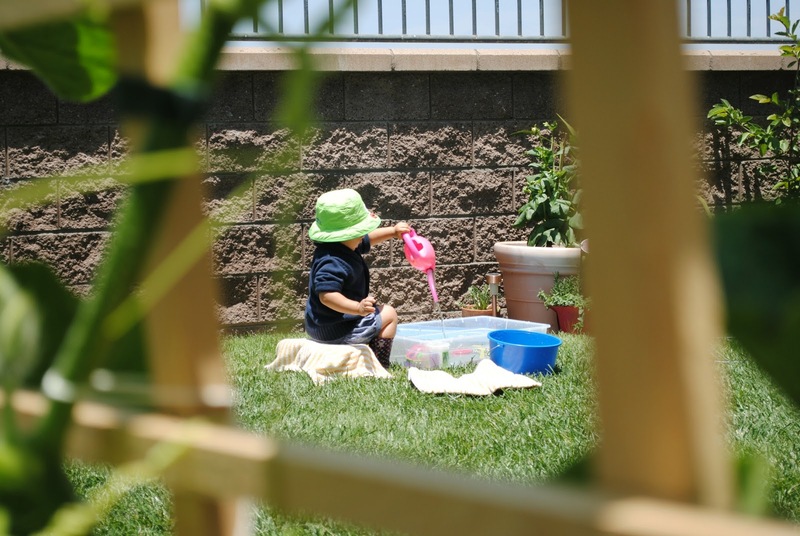 Growing up, our backyard was filled with different kinds of fruit trees and vegetables. It was wonderful. In the summer I would go out everyday and with a ladder en tote, pick a colander full of the sweetest japanese plums you have ever tasted. Yummm! Born on a farm in the Philippines, my mom has a love for gardening. Anything she touches thrives and bears glorious fruit or vegetables or flowers. Seriously... I think her blood is green. When I was little, I would watch her as she happily squats low to the ground, weeding and talking to her plants. I had to be on my toes, because my mom would throw worms at me for her entertainment. Funny lady. No, not throwing worms, but gardening. Planter #1 I have the bigger plants. Have you ever had kabocha squash? 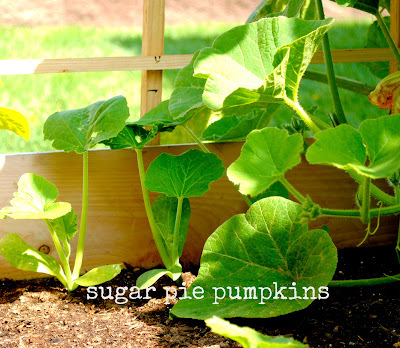 It's a Japanese winter squash and it's dee-lish! It's sweet and great in soups. 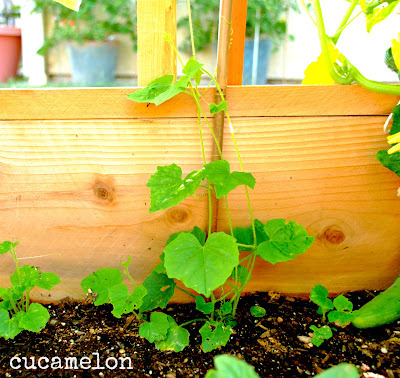 How about cucamelons... heard of them? I've just learned about them this year. They look like tiny watermelons, like the size of large grapes. 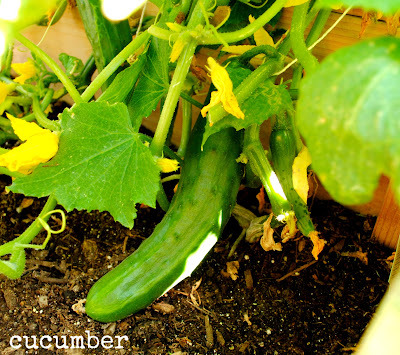 Some describe the taste as lemony cucumbers and is perfect for salads and pickling. Check out this video. Out of everything in my garden, this by far is the one fruit I cannot wait to have. Boy, wouldn't it stink if I didn't like it? NAH! That won't happen. I've got quite a few cucumbers growing. Slice these babies up with a splash of rice vinegar, a pinch of sea salt and black pepper and you got yourself a little piece of heaven. So far I've counted 10 kabochas. 10!!! Mmm... that's a lot of soup. They're nubs! Perhaps I pulled them too early? 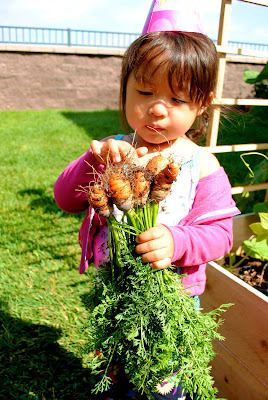 Any ideas to grow long carrots? The first ichiban eggplant flower. 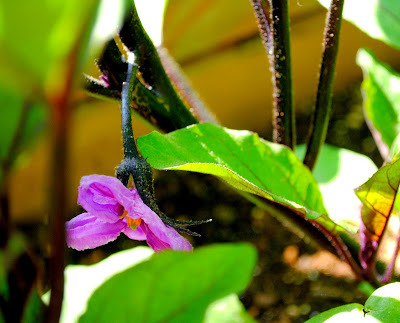 These are the long and slender eggplants. My MIL likes to BBQ them and then mash it up and add lemon juice, coconut milk and salt. It's SO good. 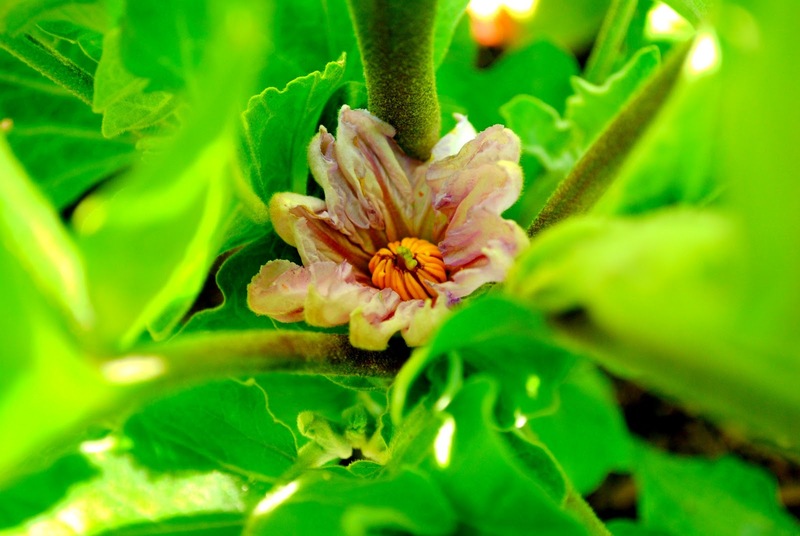 Here's the italian eggplant flower. I'm scared to touch these flowers, as they have tiny thorns on the backside. 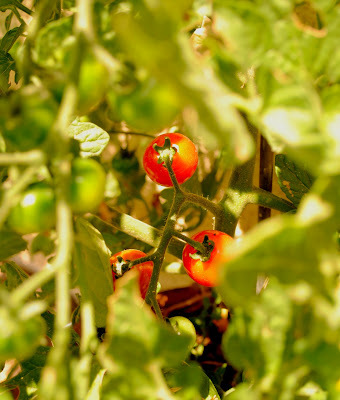 Ahhh... cherry tomatoes, Lala's favorite. 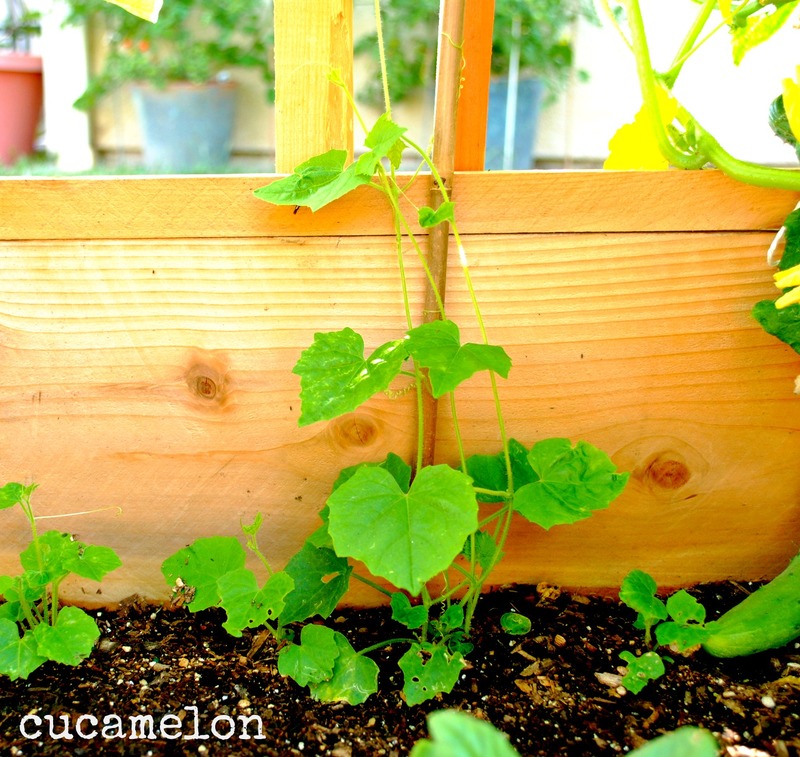 I can't wait to hear how the cucamelons turn out! Your garden is very impressive! I love love love kambocha, I didn't think I had room this year, now I'm like duh, go up! Thanks, Carla! 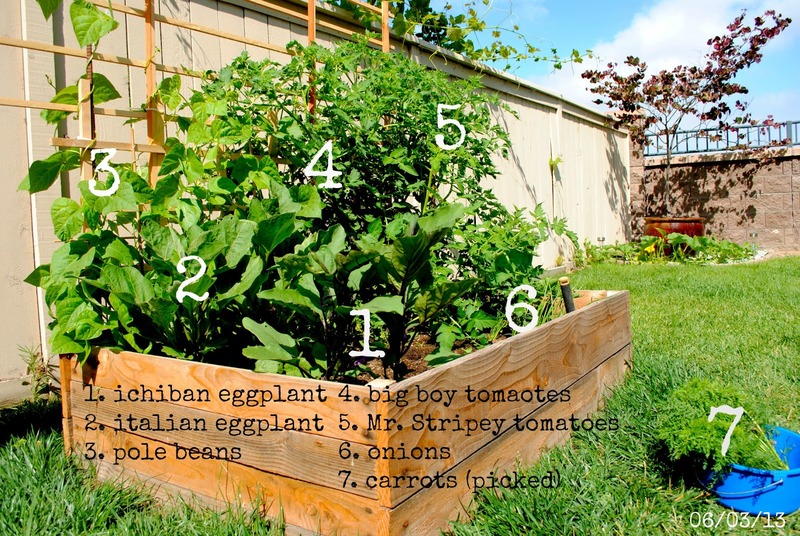 I'm already planing out for next year and adding another raised bed planter. 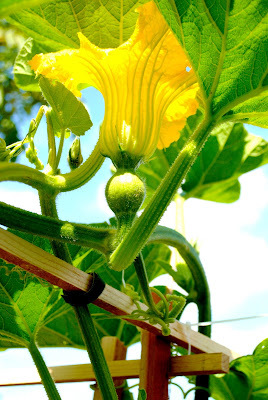 It's going to be interesting when the squashes start to really grow on the trellis. I'm thinking of using pantyhose to hold 'em up. I'm jelly, Venus! I wish I have a piece of land or at least bed planter where I can do gardening too. My kids also like cherry tomatoes, it is a must in our fridge. JC likes tomato, cucumber, lettuce and she only allowed to bring fruits or veggies to her class for snack (bread, cookies, biscuit aren't allowed :)). like everything else in my life, i should have consulted you before starting my first garden. 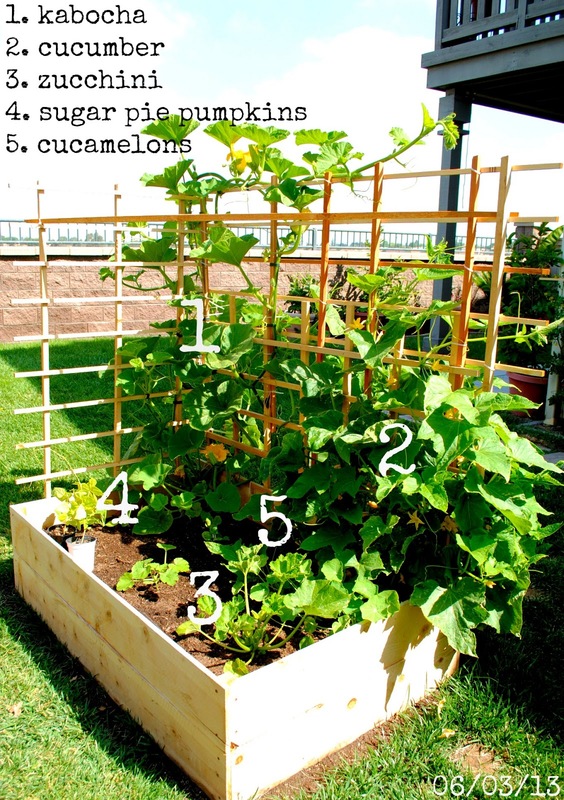 trellises built in to the planters--brilliant! we got a late start so our plants are only now starting to sprawl, but all our squash and cucumber are going to be a tangled mess at ground level. we planted some carrots too, so if they grow long and straight by chance, i will let you know what seeds i used and how i put them in, but it would be total luck! and, the water bin for lala is also brilliant. 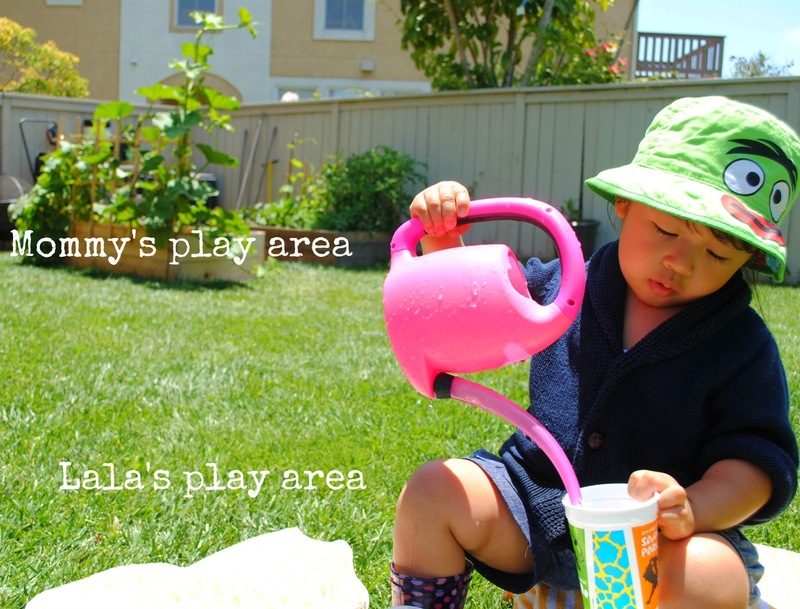 my kids are coming up to me every 30 seconds asking for more water in their little cans, so it takes forever to water everything! 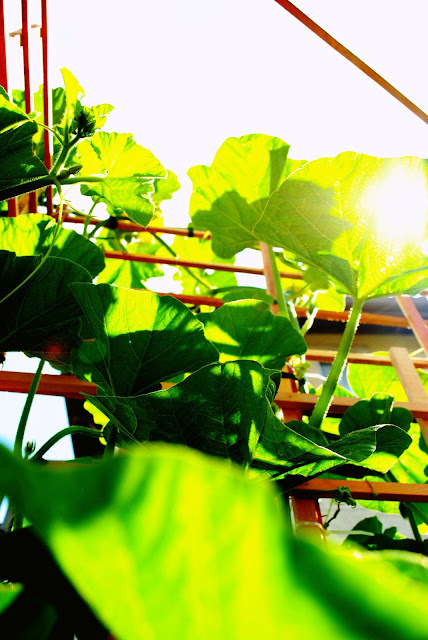 I'm hoping the trellises will hold up when the squash gets bigger. Please let me know how your carrots grow! I'm going to try and sow more seeds this weekend and hopefully I'll have better luck. This time, I have different seeds. Oh man, the water bin is perfect for Lala, she doesn't even notice I'm there! When she's done (and soaking wet), I just dump the water and close the lid. Easy-peasy! I also have another bin filled with rice. Ooh, pretty garden! My mom has an excellent green thumb too though she didn't pass that trait onto me...I have the black thumb of death! I'm gardening a few vegetables too! Your recipe for Japanese eggplant with coconut milk and lemon juice sounds so yummy! I need to try it when I can get one from my garden. Thank you, Olga! 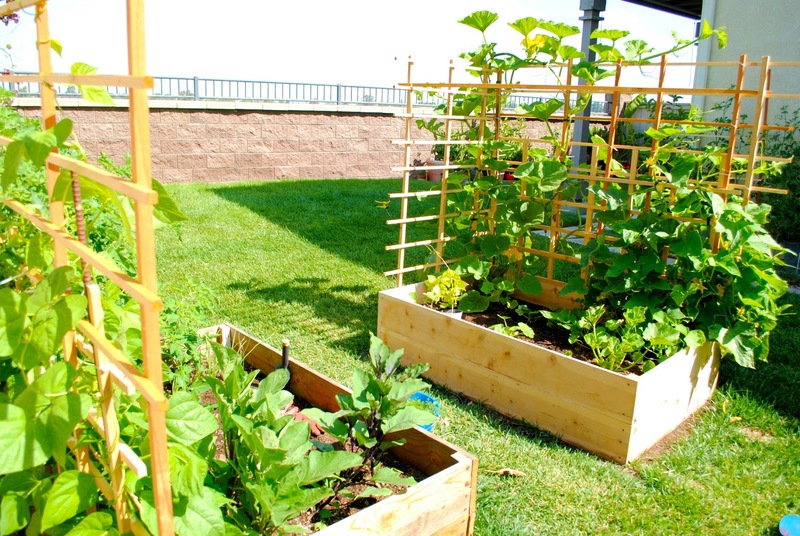 Do you have any plans for gardening this year?